Lawson Minerd was born on Oct. 24, 1859 at Hexebarger, near Kingwood, Somerset County, PA, the son of Charles and Adaline (Harbaugh) Minerd. He was active in our family's reunions in the 1910s and '20s. At the age of eight, Lawson and his parents and siblings moved to a farm at Nicolay (Maple Summit), near Mill Run, Fayette County, PA, an area where Lawson's great-grandparents had settled as pioneers in 1791. He grew up knowing many of his extended cousins in and around Fayette and Somerset Counties, PA.
Lawson is known to have "stood up" for his first cousin once removed, Rachel Long, when she married John B. Pritts on July 18, 1886. The Minerds had two sons -- Albert "Ward" Minerd and Otis "Freed" Minerd. They lived on an 70-acre portion of the farm owned by Lawson's parents at Maple Summit, and spent virtually all their adult years there as farmers. In the photo shown here of the hay wagon, Lawson stands at upper right, and Lutitia at lower left. Click to see a larger version of this photograph. Active in community work, in 1904, Lawson served as a school director of Stewart Twp., Fayette County. He also was an elder of the Peoples United Church of Maple Summit, just a short distance from their farm, circa 1897 through 1912. In February 1936, Lawson made some remarks at a surprise party for Rev. Paul A. Morris at the parsonage of the Mill Run United Brethren Church. In reporting on the event, the Connellsville Daily Courier said: "A fine program, directed by Mrs. F.B. Livingston, included group singing, solos, readings, recitations and addresses by D.L. Dickey, superintendent of the Sunday school, and Lawson Minerd. Rev. Morris responded with remarks of appreciation." Later, Lawson served as superintendent of the charter Sunday School of the newly built Hampton Church of God near Mill Run, opened in November 1940. He also served as teacher of the Hampton church's Bible Class. A photo of the church is seen here circa 2000. The family received shocking news in 1905 when Lutitia's brother Albert Steyer, living in South Dakota, was killed in a railroad accident. Lawson and Lutitia are mentioned in the 1912 book by John W. Jordan and James Hadden, Genealogical and Personal History of Fayette and Greene Counties. In 1913, Lawson and Lutitia went to the first Minerd Reunion at Ohiopyle, the first of many they attended over the years. In 1922, he was elected president of the reunion, but for unknown reasons he was absent at the following year's event, held at Confluence Park. 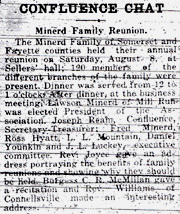 In 1925, Lawson again was elected president of the Minerd Reunion, with Joseph Ream elected Secretary-Treasurer and Freed Minerd, Ross Hyatt, L.L. Mountain, Daniel Younkin and Joseph M. Luckey named to the executive committee. Lawson attended the 1930 Minerd-Miner Reunion held at Shady Grove Park with his sisters Martha Gorsuch, Sadie Luckey and Jennie Woodmency. His name was published in an account of the affair in the Huntingdon (PA) Daily News, in a column authored by his niece Laura Jane (Minerd) Williams. The Minerds sold their old family farm and housewares and retired to Mill Run just after Thanksgiving in 1926. A poster advertising the public sale is seen here. When Lawson's cousin Rachel (Long) Pritts and her husband John celebrated their golden wedding anniversary on July 18, 1936, Lawson and Lutitia attended, and are pictured in a panorama photograph taken that day. On Dec. 22, 1940, they celebrated their 50th wedding anniversary at home with 61 guests from Mill Run, Lemont Furnace, Dawson, Somerset, Stoystown, Ruffsdale, Connellsville, Confluence and Poplar Grove. Girls Scouts sang Christmas carols throughout the afternoon. Lawson died on June 8, 1944 at the age of 85. The community church newspaper, The Messenger, printed a poem written in tribute by neighbor Laura Hewitt. Among the many mourners known to have attended was Harry David Miner of Connellsville, whose mother Rosetta (Harbaugh) Minerd was a double cousin of Lawson's. I know you have been praying for all of us who [are] over here doing our little bit to win this war. I don't want you to quit for one minute because it looks like it is about over, but just keep right on. I'm sure that is the reason we are making such progress. I read in the 'Messenger' the poem that Mrs. Hewitt wrote about Grandfather. I think it is very good and I am going to keep it. I sure wish I had seen Grandfather before he was laid away but we know he is happy where he is. We have no need to worry about him. If every one was like him, we wouldn't be at war today. Lutitia died of scarlet fever on May 24, 1946, at the age of 80. She is buried beside Lawson at the Indian Creek Baptist Church Cemetery in Mill Run. Lawson and his son Ward are mentioned in the 1970 book, A History of Mill Run, published by the History Committee of the Socialite Club.